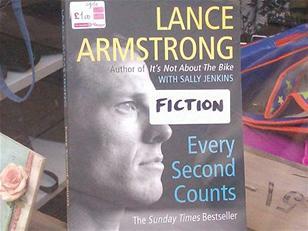 A bookseller in Glasgow is displaying Lance Armstrong’s memoir with a sticker proclaiming it fiction. I’m really sad about the Lance Armstrong saga. I love to watch the Tour de France on television — it’s like a beautiful travelogue with a tactically fascinating race going on at the same time. It’s utterly amazing that these guys can do what they do — and I am not sure how I feel about the fact that some of them take unauthorized substances to help out. Lance Armstrong was such a cool rider. He’d pounce at the exact right moment, and annihilate the competition. His tactical sense has nothing to do with drugs, though I guess we have to accept that the drugs must have enabled him to execute the tactics. Still so many of his competitors have already been disgraced because of proven drugging, that in a weird way the unfairness turned into an even competition.